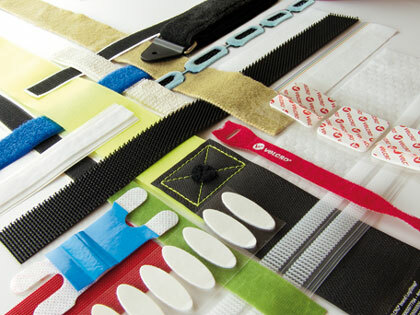 Velcro Industries specialises in custom design, fabrication, and manufacturing services. We can provide a complete design-to-delivery solution based on your precise requirements. Or we can work with your product design and manufacturing teams to deliver custom materials, components, or finished products. Velcro Industries offers an unmatched range of hook and loop options. However, if you need a new hook shape, a unique colour, a special adhesive, or a hybrid technology, our design and engineering staff will work with you to design, test, and manufacture the material that matches your requirements. Velcro Industries can serve as a manufacturing partner for products that fall outside of your existing manufacturing capabilities or that incorporate multiple VELCRO® Brand components. We specialise in manufacturing products for the Medical and Packaging Industries, including orthopedic braces, protective headgear, and heavy-duty, reusable straps. Collaboration with our customers is the source of our inspiration and innovation. Our design and engineering staff can support your product development—from prototype to commercialisation. We also provide expert logistical support for our VELCRO® Brand product suppliers and customers at every point in the global supply chain.